Tap! Magazine – the iPhone and iPad magazine from Future publishing and newest member of the TechRadar network – will now be published monthly after strong sales. 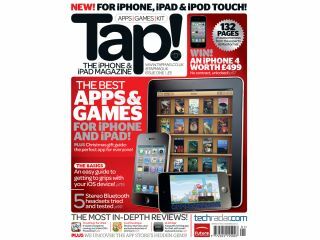 Tap launched in October last year as a bi-monthly publication, but has sold well on newststands and through Zinio. So, from the 12 May issue (number 4) will be the first on the new schedule, bringing app, games and accessories reviews on a more regular basis. "The feedback about the magazine has been tremendously positive," said editor Christopher Phin. "Pretty much the only bad thing people have said about it is that it comes out too infrequently, so I'm delighted that we have the staff and resources to give our readers just what they've asked for! "Apple sold 15 million of the original iPad alone even before the recent launch of the new iPad 2; we're here to help iPad, iPhone and iPod touch users of all abilities get the best from their devices." Charlotte Morgan, Publisher for Future's Technology portfolio added: "We were confident at launch that producing an iOS title, in light of the growing popularity of Apple's devices, was going to be a strong strategy but never envisioned such strong uptake of the title, both in print and digital versions, so early in the development of the product. "We're delighted with the response that the title has received and the ongoing opportunities in this market."